Hi, we set a reward algorithm for users. If a user post 50 replies, Nodebb will give him 1000 reputation. But now the users reputation is ten times more. For example a new user now has 136.2 K reputation ! I don't know what node has done. Hi @mohammadhassan99 -- can you take a screenshot of the configuration for that reward, so we can try to reproduce on our end? @julianlam How can we undo the reputation that system has given to users? 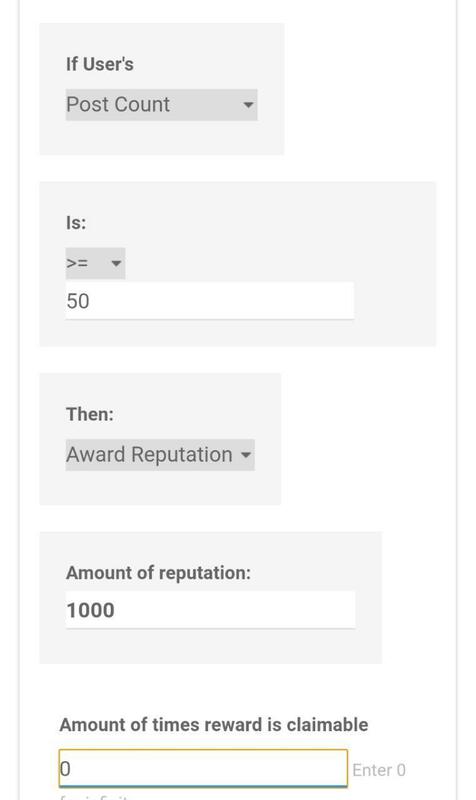 Btw, it seem you set Amount of times reward is claimable to 0 which means infinite so whenever the user makes a post after 50 posts they will get 1000 reputation. That should be set to 1 if you only want to award them once.